Please share your creations and your comments on others' projects in this thread. Do you prefer that we calculate our points with the posted project, or on the other thread where we marked our spots? I find it easier to calculate points for each page right with the linked page--so here. Then I copy and paste the numbers into the Rules/ calculation thread where I can keep a running total. Here are two pages from me for today. Will add up their points later. I have been itching to scrapbook these photos dd texted me on Thursday. And AussieMeg 's 28-4-28 Day Two challenge gave me the perfect colours. I also attempted kitbop 's mega cluster challenge. Was a little worried this would be over the top on that front--I mean, I could keep piling the elements higher and deeper just like their snow piled in last week--but I think I like the final result. I love it grammadee! The blues are gorgeous. Funny, when I saw AussieMeg 's pallettes I was drawn to the wintery ones too. Probably because it's the current colour of my world And yes, my mission is life is to get peas to not be afraid of the cluster With the restful space you've left in other parts of the page, it doesn't look too cluttered at all! Here's mine for the Day 1 challenge, Lift AussieMeg . Day #2, color challenge. A winter layout with the second autumn color palette. A sketchy Saturday challenge as well. Wow, jeremysgirl. Two for two! You are on a roll! If your creation is in response to a 28-4-28 challenge, please share it in BOTH places, but add your points for it in this thread. I doubt there will be many points for this, unless I start chucking on some elements! AussieMeg, lovely, the pps flow together and are just lovely. kitbop that layout is wonderful! So much eye candy to look at, yet your photos are still prominent. I just love it! Left love in the Gallery, kitbop . Awesome happy page! Here is my two pager, again with photos dd sent me from last week. Their little guy and their dog were in heaven with so much snow and temperatures in a range where it could be enjoyed. 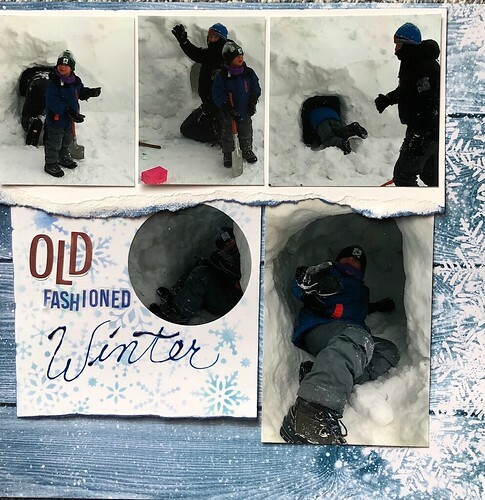 Dd is not such a fan of outdoor activities in the winter, but she enjoyed spending time with her ds and his friends. I am just glad she had time to snap a few photos for me to scrap. Here are my pages for 28-4-28 days 3 and 4. I really need to start adding up my POINTS! Should be easier now that the challenges are closed and that @mdscraphoholic has posted the printable list. kitbop and grammadee and justjac , I left love in the gallery. Great layouts to start the month, ladies! jeremysgirl , your page with the doggie is cute. I love the big flower and the multicolored circles. Your layout of the chair is beautiful. Such a great photo of a comfy looking chair. 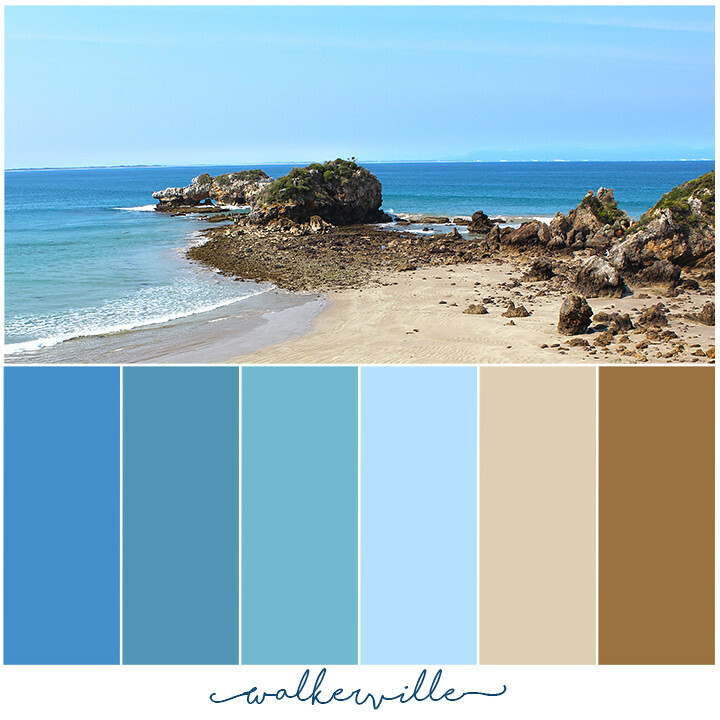 Your colors and layering are wonderful!! Here are my first 2 for this month. 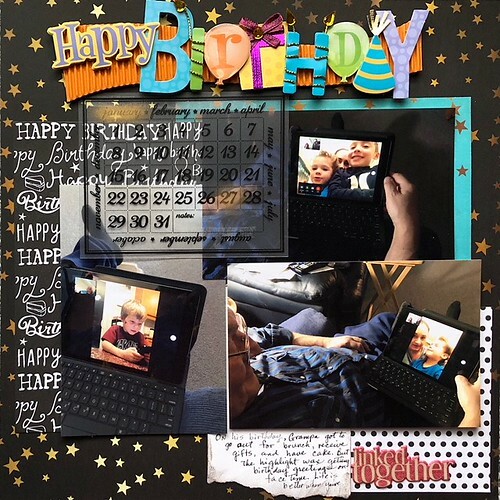 #2 Leave 5 comments, #3 28-4-28 Day one, #5 Love this family, #9 Red, #17 Christmas 2018 +2, #18 Hoarded SU dies I forget to use, #21 Stitching, #20 6x6 SU pads, #22 Dies, #23 Opposites-red & green, #26 Sparkly glitter paper, #27 Had to have SU dies then never used #41 Rectangles, #45 Digital element on photo #47 Single photo, #49 Gold glitter paper ornaments, one page posted = 20 points. grammadee, I love your snow page, but they make me cold. brr. I guess the blues and elements worked well then, huh. Actually I love the kids playfulness and it reminds me of when mine were little. Now they're less likely to build forts and such. Happy Birthday: Love your title work on this page. jeremysgirl, BUILD: WOW! I need chairs that well built too! Your daughter did a fantastic job! I love the way you captured the story with the pink, the title work, and the sewed border. BRRRR: what a sweet pupper! I like the grid style and the work labels. So cute. AussieMeg, Walkerville, I love the simplicity of the layout. It's a beautiful beach. Also a great color challenge. 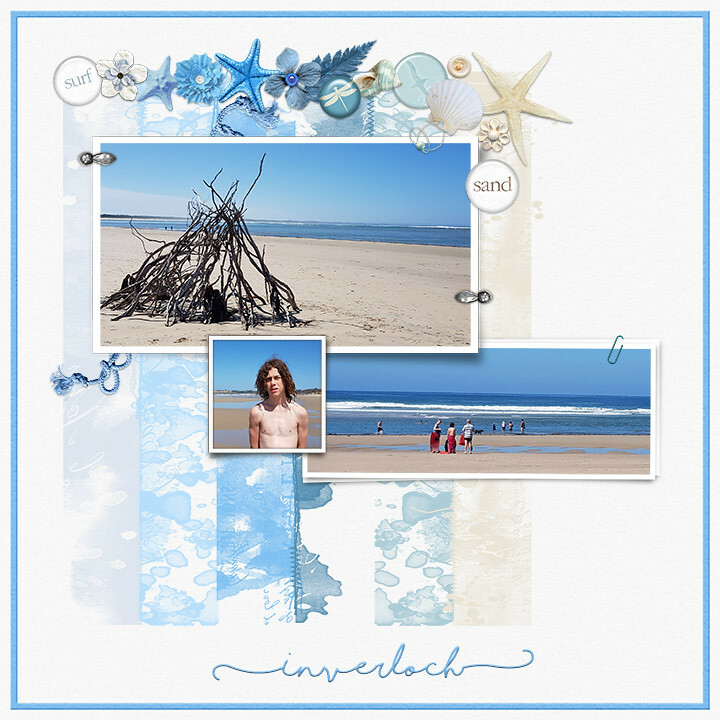 Inverloch: beautiful page! I love the top cluster!!! and your patterns. kitbop, So Lucky: that you shared such a fab layout. I love everything! I just keep looking and looking. Did you just doodle a border and mist the back white cardstock? The smaller whites with the hearts and doodles, did you stamp? 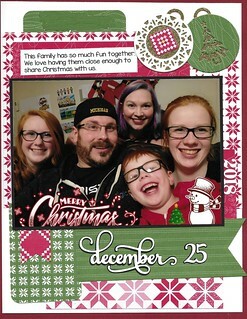 nylene, december 25: Beautiful family and page. Great patterns and layers. Forever: So pretty and lets the photo shine. 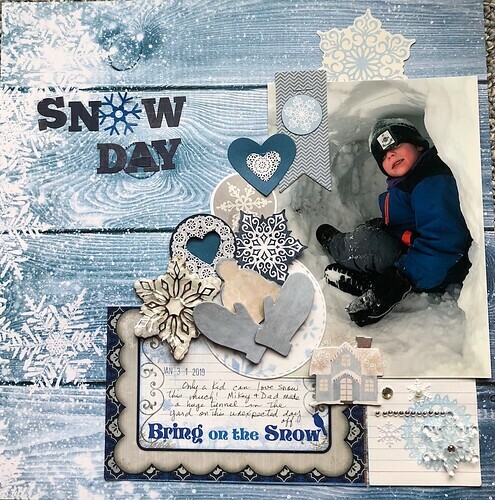 'Old Fashioned Winter Snow Day': Oh, that blue wood grain paper with the delicate snowflake print on the edge is so pretty (and absolutely perfect for those memories)! It's really nice to see the mega cluster in action as it's a little scary to attempt. Thanks for leading the way! Did you use letter stickers with a clear background for spelling out 'fashioned'? I see a faint, shadowy outline and I'm intrigued. 'Get Outside': Love-love-love the storytelling dynamic with the placement of the photos. Cutting the pattern papers into hills was genius (and I noticed that you made that "housey" hill connect to the snow pile in the photo! #attentiontodetails). I'm digging those connecting rectangles, by the way and their vertical to horizontal flow: it gives great energy to the page. The pattern paper used for the sky portion of your LO is gorgeous. 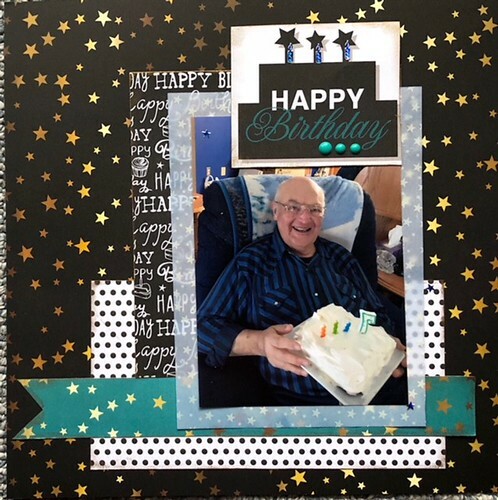 'Happy Birthday': Black backgrounds are hard to do but you managed it beautifully! I love how it resonates with the video call photos on the black tablet/mini laptop. Kudos on snapping those photos, by the way. This is what our lives are about these days and we absolutely should keep memories of how things have evolved and how wonderful it is to have our loved ones just an Internet call away. I adore all the stars (not just on the paper). And I smiled when I was how you spelled out 73 (or I'm assuming it says 7 - III with single candles). This double LO looks as comfortable and magical as the celebration seemed to have been. 'Build': I got such Neapolitan vibes when I saw your LO and it made me lust for summer days (and lounging in beautiful chairs like the one you posted). I love how you extrapolated the colours from the photo and then added complementing colours (soft pink and teal). I agree that Chloe did an amazing job with her first chair! 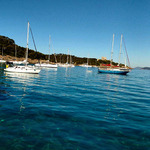 Would love to relax in one with an ice-cream as soon as the weather (finally) heats up again. 'Brrrrr': Is that Freezin' Season by Simple Stories I'm spotting? I almost bought the ephemera and chipboard from that line, almost. I really tried to hard to resist (and somehow managed). I love the story of Amelia coming inside for a different kind of warm up session. The four square design on a square page looks great, by the way. Will be back a little later tonight for more commenting on everyone's beautiful creations. Netflix is waiting for one more episode before we start winding down for the night. dasmith2, I love the angled pp and how you have the bike riding the slope. Your layering with the doilies and flowers is really pretty. Good job covering up the “oops”. I have always said, that’s what embellishments are for! Posting the LO now, and will come back and update post count when I can get on my laptop. grammadee love those snow pages! Love the colors! There's more love in the gallery. jeremysgirl that chair is awesome she did a great job on that! I love the way it really pops with the colors you used great job on the lift! Love the story about your dog and the color palette you chose. I really like your journaling block and the way you embellished that. AussieMeg - that is a beautiful photo! And Inverloch, I love that cluster across the top and the soft pattern flags! nylene and kitbop there's love in the gallery, and all I can say is WOW! dasmith2 - what a beautiful page! Love the angled PP and your cluster looks great! You would never guess you dropped an ink pad on it. I hate it when things like that happen. KikiPea that is such a fun page! That the birthday hat is hilarious lol. I love all the eye candy and how festive and fun it is! 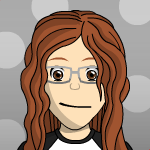 dasmith2, I love the dark teal in your layout. The design is so cool with the slanted dotted paper. I love the chipboard bicycle and the pretty flowers. That doily is a great touch. Clean and classy layout. KikiPea, I love your birthday layout. It looks like your puppy is enjoying his b-day.I love your banners in the corner and the filmstrip along the bottom. Cute little candles with sparkly flames. Love it. This is for today's 28-4-28 3/5. I used transparencies, frames, tiny bling. KikiPea, I love the birthday pup page! Such happy colours and the scattering of elements gives it a real party feel. Thinking I might want to lift your page AND its inspiration! I will leave you love in the Gallery, nylene, but I love the formal look to your page. Perfect for a graduation page. Wow, dasmith2, I LOVE that rainbow of colours with the black! And that little cluster with the hearts is really cute. So good to see you scrapping. grammadee, I missed the Grandpa Birthday page yesterday. I didn't see it at all. I love the title work on the cake design and the layers with that blue flag. dasmith2, I must have already pulled up to reply before you posted as yours wasn't there. and if you look at the time difference, yes, it does take me a long time to post. I had to stop several times, administer ds a test, make and run food to sick dd, etc. I love the triangle borders and how you still made the page soft and feminine. Fantastic cluster with the photo connected too. Is that you with your kids? If so you look young enough to be a sibling. Ukelele: such dramatic colors. They really pop on the black. Love it. KikiPea, I'm 7 Today: Super adorable. I love everything about the layout. I just keep going back and looking. I'll have to scraplift this layout. 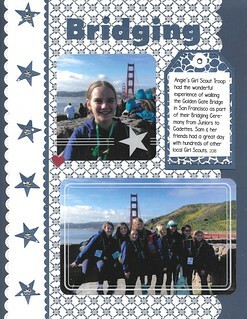 nylene, Bridging: What a cool experience and way to commemorate going up a level! You did a fantastic job on the layout commemorating the experience too. grammadee - love those snowy winter pages - you sure do get a LOT of snow! the cluster looks fab! 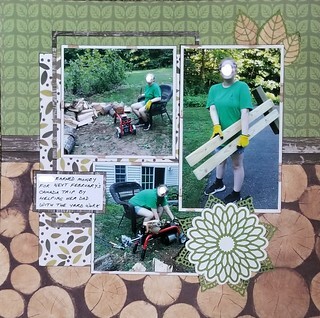 jeremysgirl - awesome scraplift! love the BIG flower and the colours and what an awesome school project! Brrrr! looks fab also - those colours look great with that white background and I love the title! AussieMeg - I love the simple colour palette layout - fab photo and the palette is the perfect accent! And the beach layout - love that cluster along the top! kitbop - WOW - those colours look awesome -such a cheerful bright layout! grammadee - you're on a roll! I love how you echoed the slopes in your photos with the background layering! 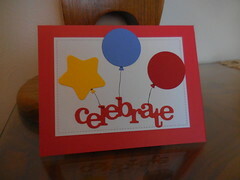 The birthday layou is lovely - that star paper is great and I like all the layers and that bright title. nylene - I always love your pages! the layering and colours are great on the Christmas layout - and just enough white to balance it. 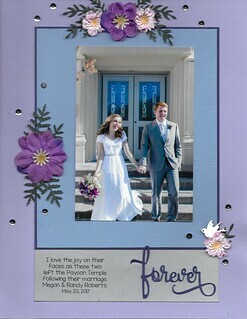 Flowers are gorgeous on the Forever page and what a lovely photo! KikiPea - so fun! 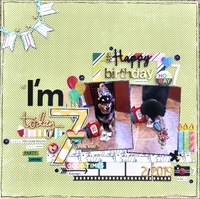 love the banner and the big 7 and all the layering and embellishments! 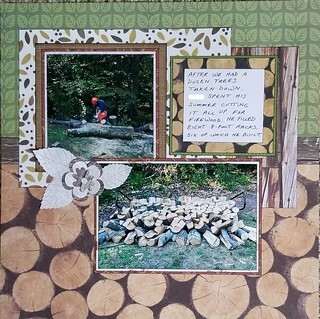 nylene - lovely monochromatic page for Bridging - that star border is great and I like how you balanced it with the other border. dasmith2 -love that rainbow background and the colourful title for ukelele! okay -I think I'm caught up now - loving all the inspiration on this thread! I finally have a couple finished. Sorry about the lousy photos. It's dark here today, but at least we're getting a break from the cold. 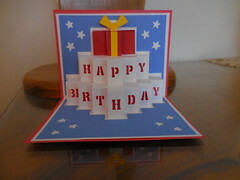 Here is the card I made for DGS's birthday. It was from a new cut file from Design store. Took a little doing, but I'd do it again. #2 Comments on 5 projects, #9 Red, #14 Stars, #22 Die cutting, #24 Scraps, #33 New cut file never used, #41 Rectangle, one card posted = 10 points. 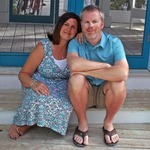 @dasmith2, I love your ukulele page with the rainbow look. The black background makes it really pop. The tiny little embellishments are perfect. BTW, I had the same thought as LisaDV , I thought all three in your layout were siblings! msliz , I have left love in the gallery. Love that wood look paper! It is 40 below here today--and I am not exaggerating!!! So I am in the house scrapping instead of off on an adventure (which has been postponed). Here is my two-pager for 28-4-28 Day FIVE.